The SUArt Galleries at Syracuse University invites families to explore the world of art on Saturday, Dec. 4, and Sunday, Dec. 5. Children can participate in SUArt KIDS, an interactive art gallery experience that includes guided exhibition tours and art-related stories and activities. The educational program is designed for family audiences and was created to help children learn about the world of art through interactive stories. Children ages 5-10 can participate in interactive gallery games, create with color and texture, and engage in arts and craft activities. The activities help introduce children to the world of art, strengthen fine motor skills and promote artistic creativity. 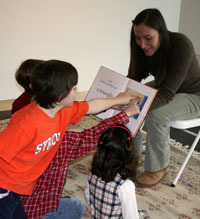 The program will be held at the Syracuse University Art Galleries in the Shaffer Art Building on the SU campus. This event is free and open to the public Dec. 4 at noon and Dec. 5 at 2 p.m. Contact SUArt Galleries at suart@syr.edu or RSVP to this event on Facebook.